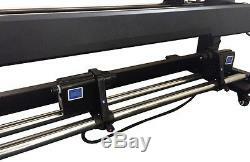 Vinyl Express V 1600mm 63 Large Wide Format Printer DX5 ECO Solvent+RIP, 1440dpi. Max Printing1650mm, 63 , Epson Dx5 Printhead, 1440dpi. With One Head, Model 16S1. With Dual heads, Model 16S2. EPSON TECHNOLOGY, HIGH RESOLUTION, HIGH SPEED, LOW COST. PERFECT&ECONOMIC SOLUTION FOR CAR WRAPS, OUTDOOR VINYLS, BANNERS, STICKERS, SUBLIMATION, LEATHER, WALL PAPER, REFETIVE FILM Etc. 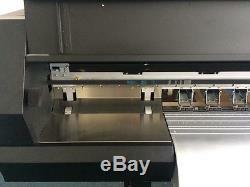 Epson DX5 solvent print head(s), Max 1440dpi with double 4-color ink supply system , Better result than DX7. New updated appearance, High manufacture craft for all components. High accuracy media feeding system and heavy duty media auto take up system. Bulk ink supply system with 4x 440ml ink tank and 4 exterior big volume tanks. Imported HIWIN linear rail with double-slider ensures smooth ink carriage movement. X and Y axis both take servo motors, more stable and lower noise during printing. With intelligent heat and fan 2in1 system. 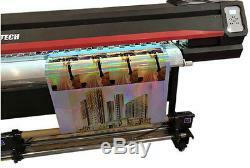 Automatic flash-jet function to against print head jam, keep it wet while printing and standby. Metal carriage maintenance station with electromagnetic wiping and auto cleaning system. Printing start point can be set freely able to do boarderless printing. Print head height is adjustable by a knob on carriage easily from 1.8mm to 2.2mm for different thickness medias. Eco solvent ink/water based ink/sublimation ink. Maintop 5.3 with dongle. Automatic, anti-jam and keep nozzles wet. Vinyl, flex banner, PVC, One Way Vision , canvas, leather, wall paper, Etc. Bitmap, Tiff, Jepg, Eps, Pdf, Cad. Ink, Damper, Cap Top, Wiper, data cable. Install 2 or 1 Dx5 printhead, new refined carriage. 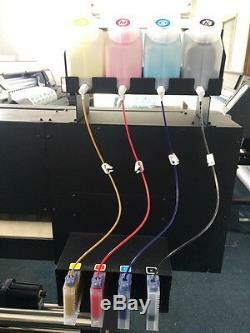 Bulk ink system with 4 exterior big volume tanks auto feeding. Upgraded carriage board supports one head and 2 heads. New rubber Friction roller media feeding and absorption platform. Big power servo motor for movement. Media detector, auto-stop when no media. Intelligent fan & heat system. Auto take up system with 2 motors. Video will open in a new window. "Its an excellent machine by the way I will try get you some buyers in this country". More feedbacks please visit our facebook: Facebook/Signstechltd. It is optional term of DDU to your door. The only arrival port in UK is Felixstowe. The default dispatch port is Huangpu port in Guangzhou, there is only one schedule each week, closed each Tue and barge leaves each Fri.
15-20 days to Australia/New Zealand/Asia. Possible delay is subject to accident factors like overstock, schedule change, strike, bad weather, holidays etc. We have professional technical team to assure our prefect service. Your satisfaction is our first priority. We will take care of the cost to send the replacement item to you. The item "Vinyl Express V 1650mm 65 Large Wide Format Printer DX5 ECO Solvent+RIP, 1440dpi" is in sale since Saturday, February 13, 2016. This item is in the category "Business & Industrial\Printing & Graphic Arts\Plotters, Wide Format Printing\Printers- Wide Format". 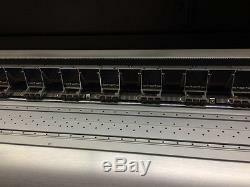 The seller is "signstechltd" and is located in Guangzhou. This item can be shipped worldwide.